March | 2013 | justonemorebiteplease! Cooking school! Weeks 1 and 2! As some of you may or may not know, I’ve started a 15 class cooking course. I’m taking it at the Institute of Culinary Education and I started last weekend. It’s a medium between the recreational courses and the year long professional course. And LOTS cheaper! 🙂 I thought I’d chronicle the course as I go, showing off my photos! Class one was knife skills. 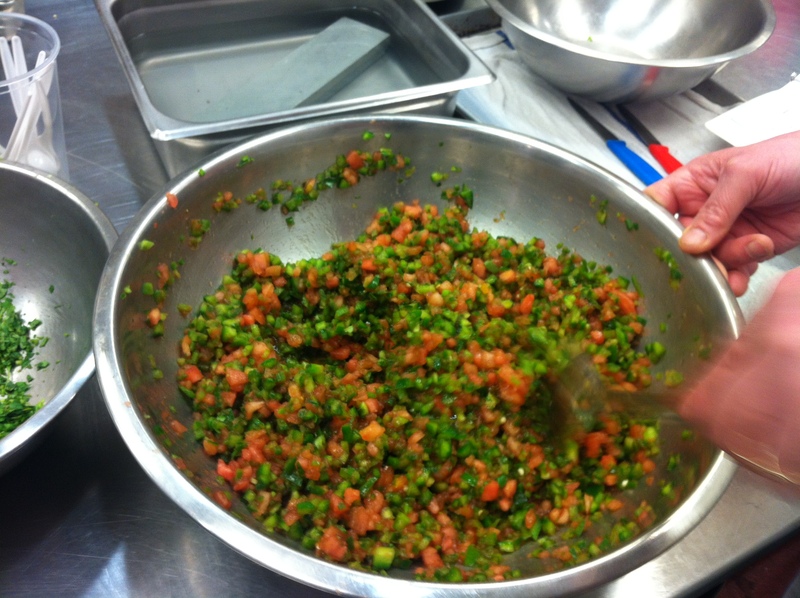 We learned a couple different cuts, and some basic info, such as the ratios for mirepoix. We chopped up potatoes into medium dice, (1/2”x1/2’x1/2’) but to get there you have to cut your potato into a rectangle, but it lengthwise to make tranches, and then cut the tranches in half to make four batons. Then cut into cubes. It’s really tricky and you end up with heaps of potato scraps. We were told the ones we were making were going to go into mashed potatoes for another class (which is what is done in professional kitchens), but I really think that was the same when your parents tell you your dog is going to live on a big farm. We learned how to cut an onion into medium dice, (it’s tricky!) and worked on carrots and celery for the mirepoix. 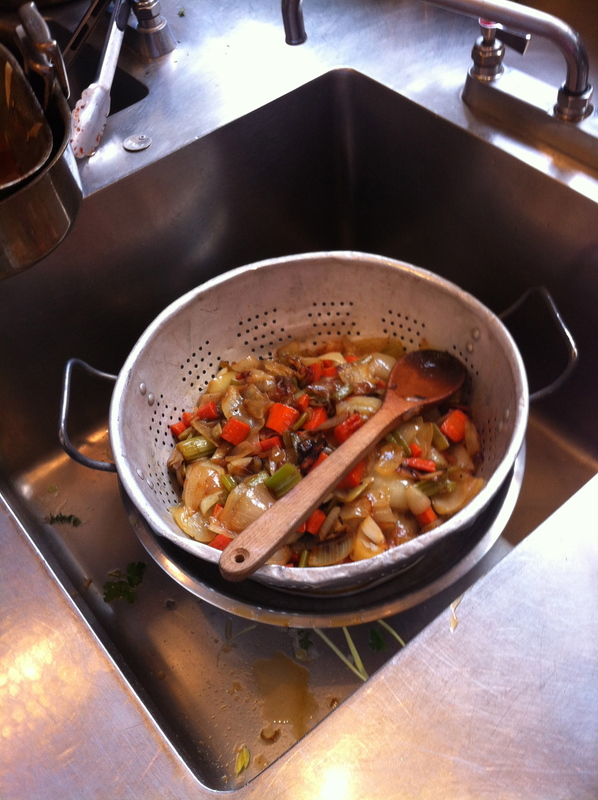 Mirepoix is the flavor base for many stocks, and is usually comprised of 50% onion, 25% celery and 25% carrot. We also made tomatoes concasse, which is tomato that has been peeled, seeded (seeds and skins removed), and chopped to your desired size. We used our tomatoes for a salsa. 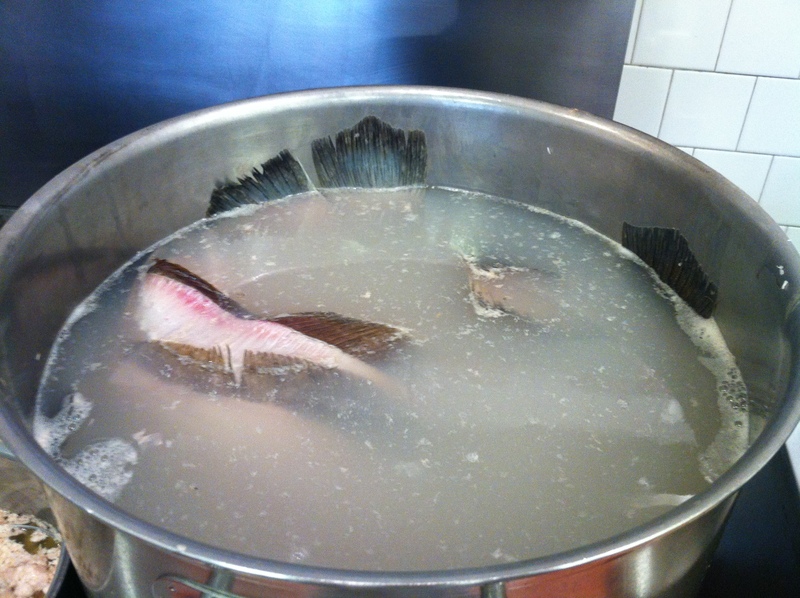 Class two didn’t seem as successful for me, and luckily was the preparation of stocks and fish fumet, ie some chopping and waiting around. Why was that lucky you ask? Well a sneaky carrot rotated while I was chopping it, and I managed to slice out the state of New Jersey out of my little ring finger. 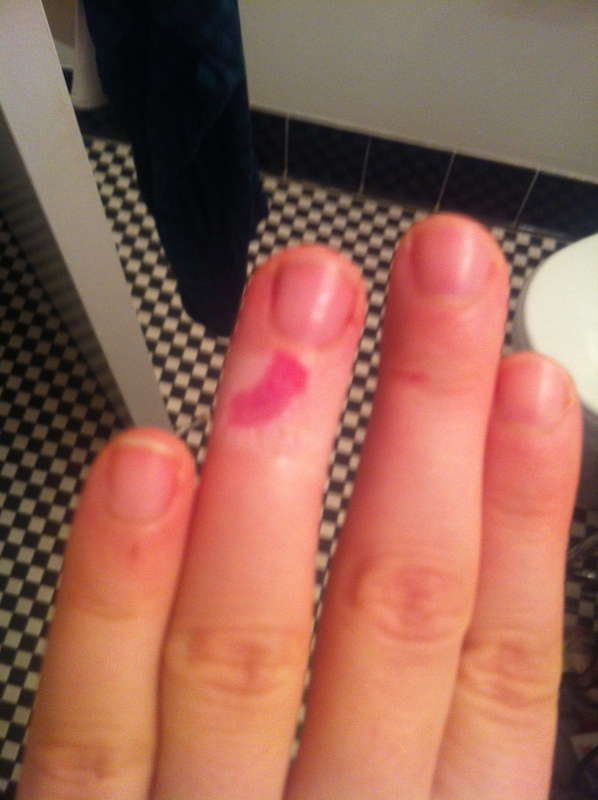 Chef Ted bandaged my finger and I put on a finger culot and a glove and tried to go back to chopping. After what seemed like ten minutes later and the finger culot had a puddle of blood, Chef Ted made me sit out from chopping with my hand over my head. I didn’t miss too much! 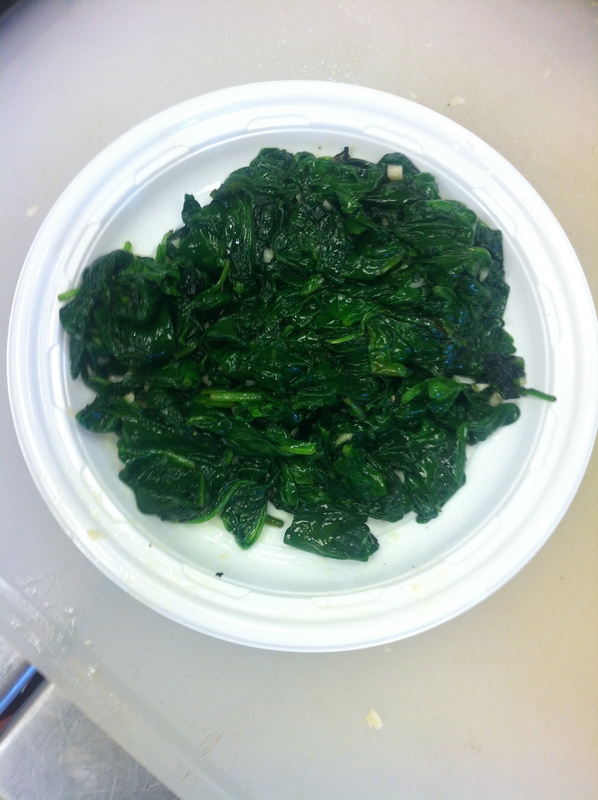 Sauted spinach. I learned that you don’t add the garlic to the oil first, you need to add it when the spinach is almost done, else it will burn. Blanched and sauted haricot verts. 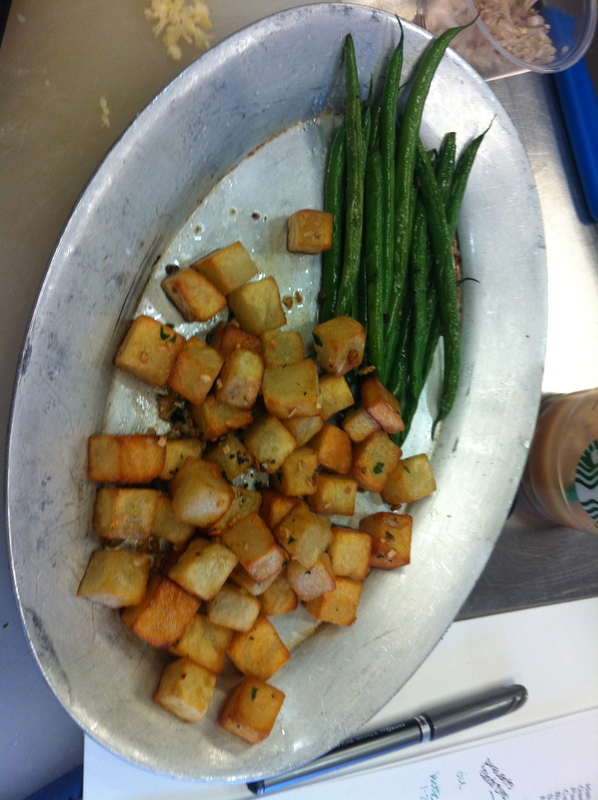 One guy saw the green beans and asked where the haricot verts were. I mean, if you can’t operate Google… I hope he doesn’t ever read this… I learned that you can keep the eyelashes on, just tear off the stem bit. Pommes persillades. Parsley and garlic potatoes. I made mine with more garlic and less parsley. Okay, I only used a teeny bit of parsley. These chefs sure do like the stuff! 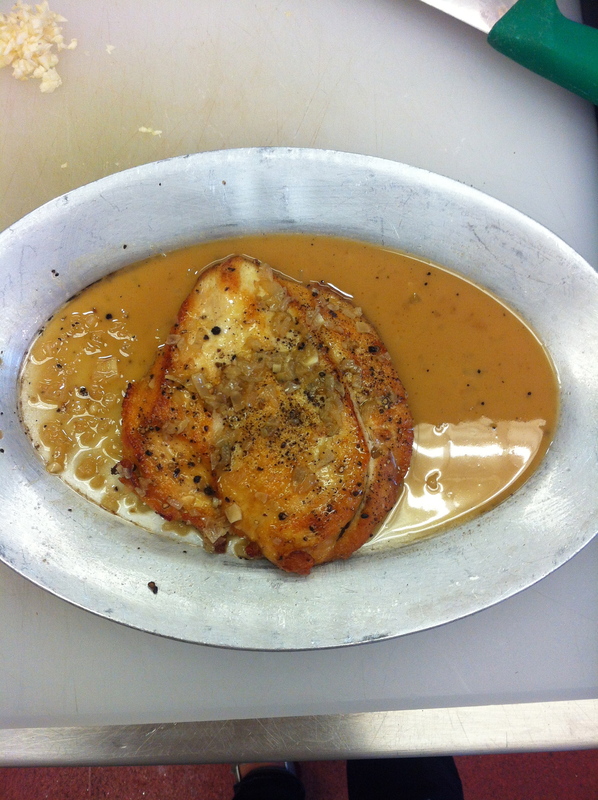 Sauted chicken breasts with a white wine pan sauce. OMG this was divine. 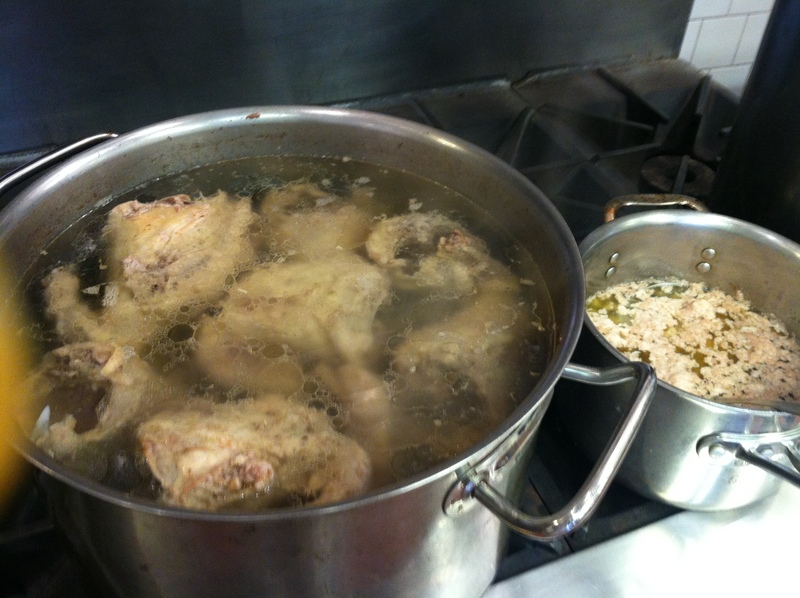 The sauce was so fragrant and I was told I cooked my breast just right. Yay go me! It was a beautiful breast. 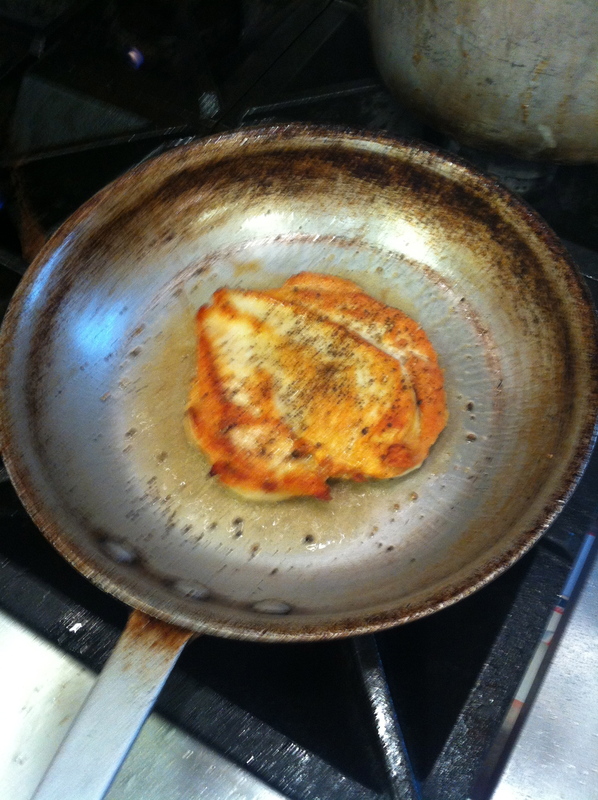 I learned that when you’re cooking a chicken breast in a pan, flip it over, cut a line down the middle, and then cut flaps out to make the chicken breast not only bigger, but all the same thickness. And then we got to pound it out! 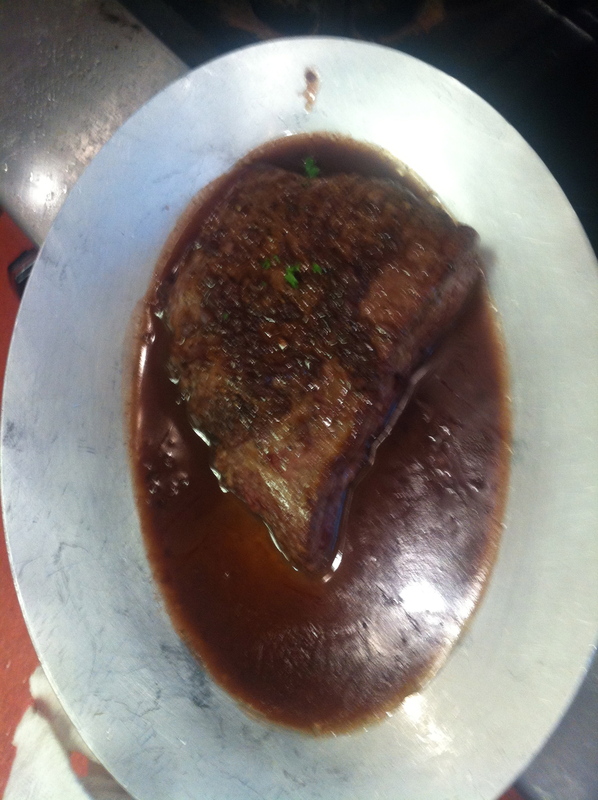 Flank steak with a red wine pan sauce. Yum yum yum. So I learned that when you put your protein down in the pan you can’t move it for about a minute, as you need the proteins in the meat to set (the Malliard reaction needs time, I’ve been reading about it in McGee’s On Food and Cooking), otherwise you’ll tear the meat. I also realized I need to not get so enthusiastic that I pour my sauce all over the meat before plating. Oopsies! Weiner Schnitzel (pan fried veal cutlets). Oh wow this was so delicious!! And I had a really great fry on mine! Yayyy. I’m not sure what I learned specifically, but it was fun to tenderize the cutlet and do the standard breading procedure. One thing to pay attention to is that when you are tenderizing, you need to make sure that the plastic wrap isn’t tightly wrapped around the edge of the meat, otherwise the veal will have nowhere to go when you pound it. 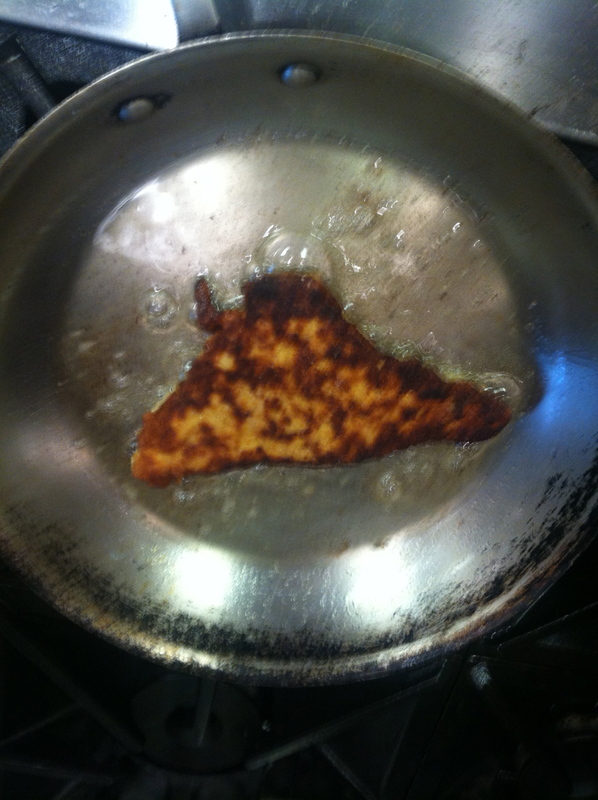 Also, once it’s breaded, you should fry it right up, don’t let it sit too long. Today, class four, was grilling, and I had a ton of fun, and all the things my dad ever taught me about grilling fell into place as to why we did it. I think I did him proud today, all my meat and fish was grilled perfectly. 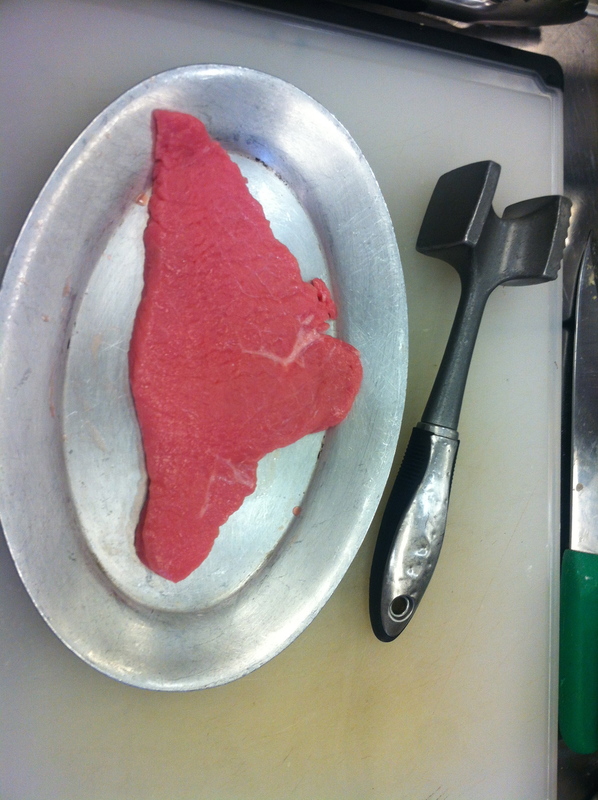 Chef told us to set your grill up in zones so that there is a hot zone, a medium zone and a luke-warm zone… i.e. why Dad always told me to pile the charcoals in one side of the grill and sear the meat there first, then move it over to the cooler zones to finish cooking. 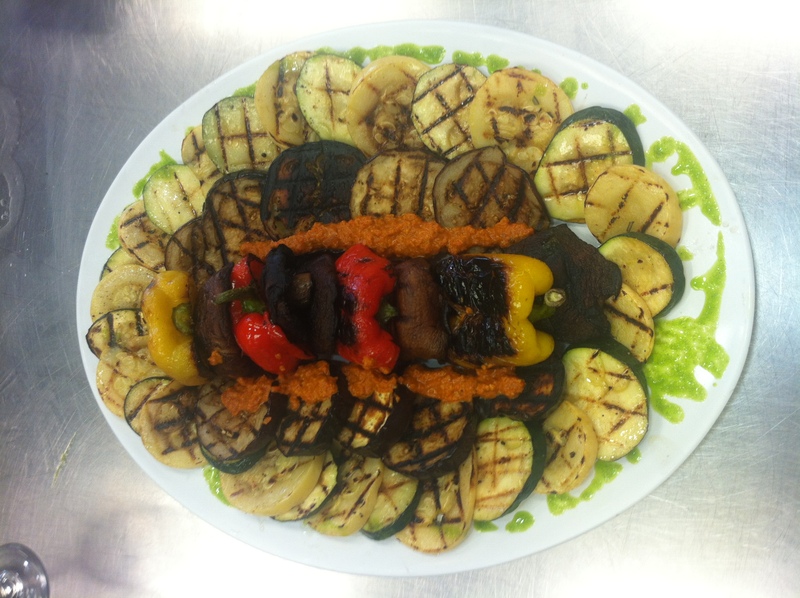 Grilled veggies (after being marinated), served with Romesco sauce and our salsa verde. 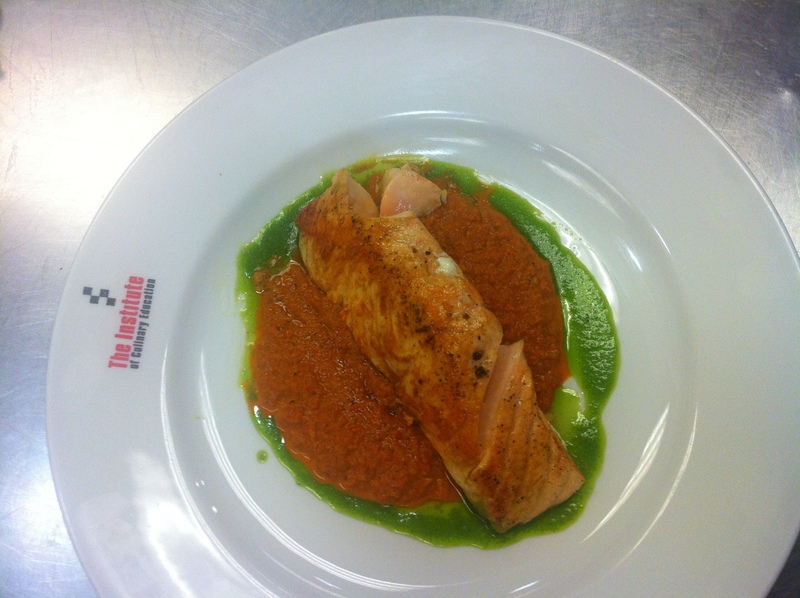 Grilled salmon with a salsa verde (a basil/garlic/olive oil/caper sauce). My salmon ended up okay, but I almost wrecked it by separating the skin from the filet, but it ended up being cooked really nicely, translucent in the center, you can see it in the second photo. My plating skills need a little work though. 🙂 I even ate it, and enjoyed it (I prefer my salmon raw)! The salsa verde was delicious, nice basil flavor with the fish. Romesco sauce. We roasted the bell peppers for the sauce over the flame and then steamed them and peeled them. Yummm. 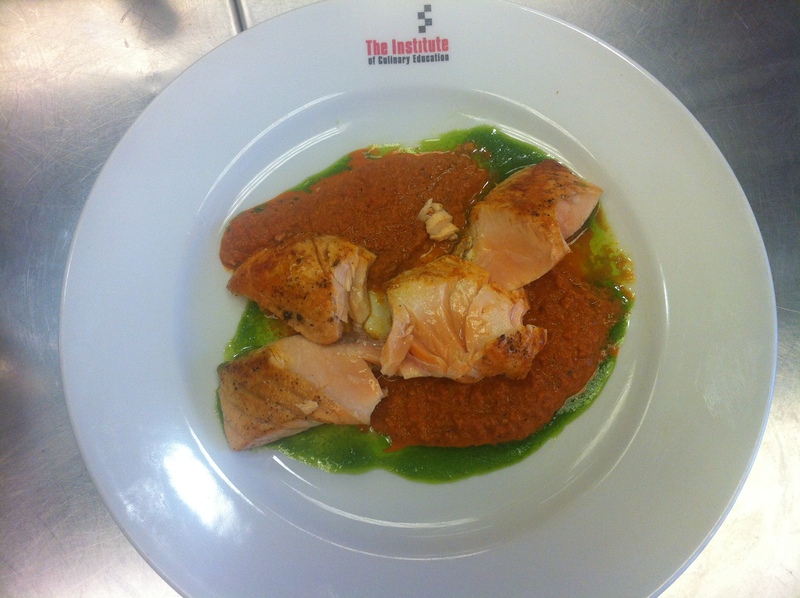 I was in charge of our table’s Romesco sauce, and Chef Ted thought it was excellent, with a good smoky flavor! 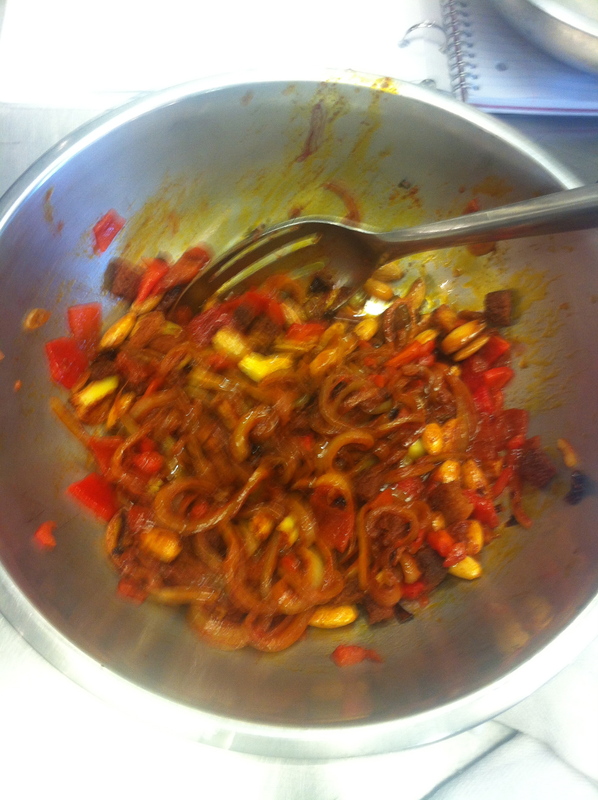 It’s really not difficult; you process a mixture of almonds, bread, garlic, onions, red bell pepper, dried ancho chili and paprika. 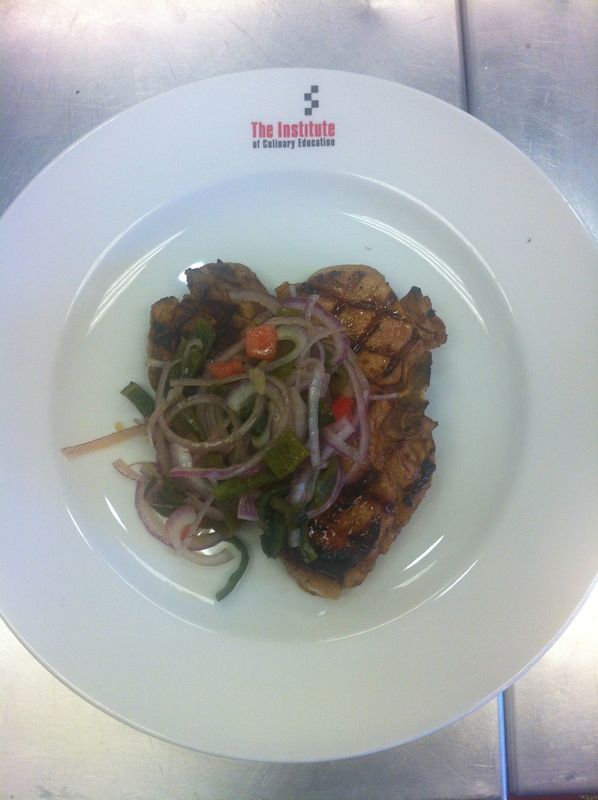 Grilled pork chop with an ancho chili paste marinade and a grilled cactus (!!) salad. 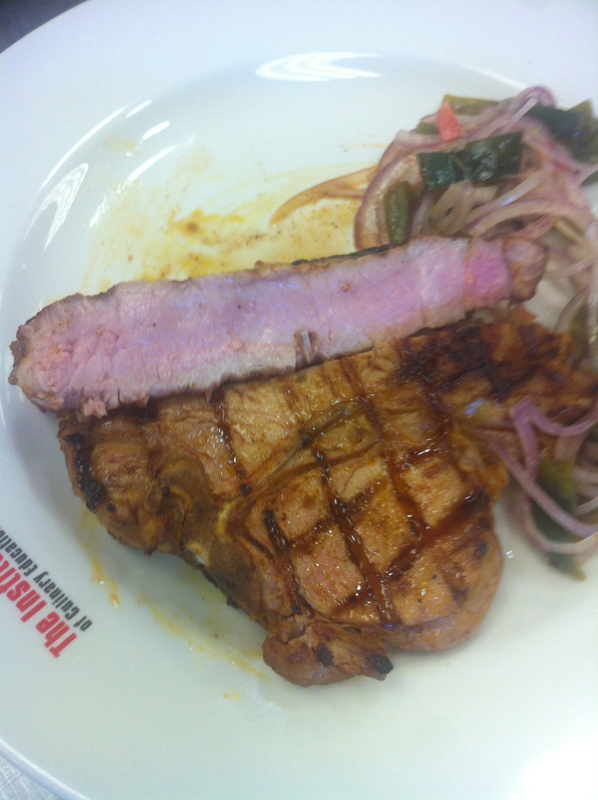 My pork chop was cooked really well, and Chef said I had a great presentation, but I really loved the salad. It was made with a cactus paddle and a poblano pepper, really great flavor and a slow working heat. 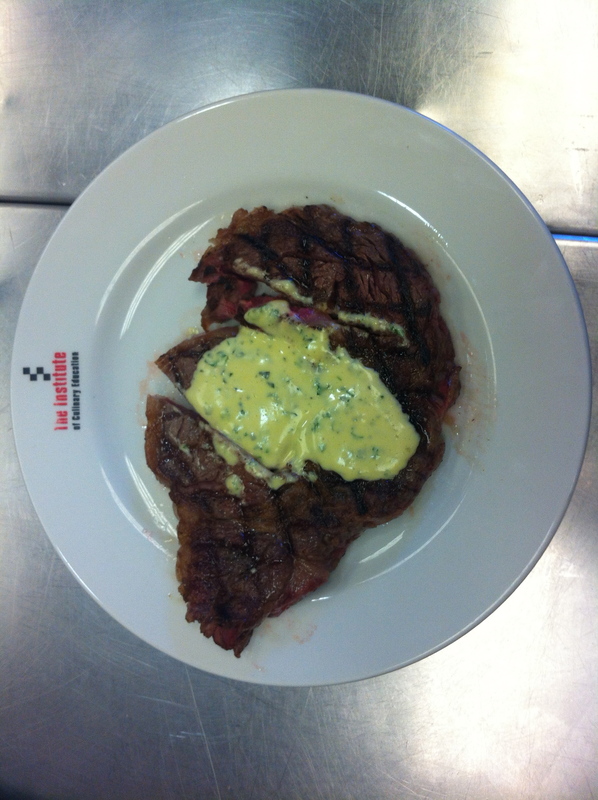 Grilled ribeye with a béarnaise sauce. I mean there’s not much to say here, except that I aggressively devoured my steak in the course of about three minutes. There was nothing to bring home but scraps. Tee hee. Just so you know, the slices were Chef Ted checking the doneness, not my exuberance for eating halted by photography.